What a great article and explanation about Drop E tuning from the master himself, Mr. Booth. Thank you Greg for sharing your approach and your musicianship. And thank you Rob for this incredible new resource. this low E tuning sounds great. thanks for sharing it. Greg’s use of Drop E tuning is a great example of what can happen when a musician takes the time to search for their own path and find their own musical expression. Granted he’s a monster musician with a deep knowledge of music and incredible chops, but his composition skills are what really sets him apart. 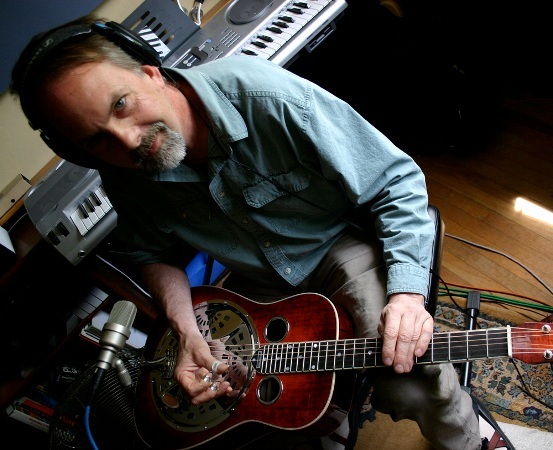 Greg’s music and arrangements are a great contribution to the squareneck resonator guitar community. I have noticed that on the Folsom Prison vid you play some licks that sound like Jerry drive type on East Bound and Down and also Dave Dudley Six Days On the Road type trucking licks. If I am correct they go da and da da -da da and da da. How do you get these type of licks; I noticed you use a lot of your steel pedal playing experience for blocking etc. Such an insightful and helpful article/interview. Many thanks Rob & Greg.